Instead of the compost heap, try saving some scraps for the dyepot! 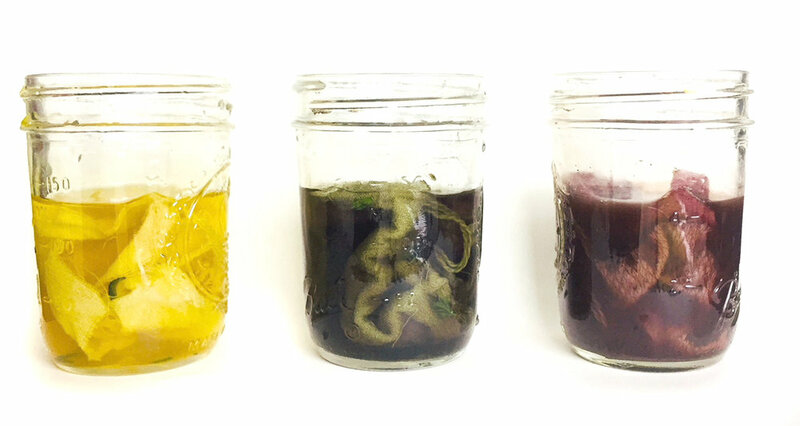 Though colors can be unpredictable, working with natural dyes from the kitchen and garden can provide stunning results. I tested out a bunch of kitchen dyes I've been saving (and some I just found in the back of the fridge...) and was delighted at the colors. For each plant, I crushed the materials a bit to make it easier to extract color and placed in a glass jar, poured boiling water in the jar, and let sit overnight to steep (covering to keep all the goodness and heat in). It would have been wise to weigh the plant matter so I knew how much to use later, but I have an affinity towards doing the work twice. The next day I strained the plants out of the dye, then put into each jar a bunch of pieces of mordanted and unmordanted silk and cotton fabrics, and mordanted wool yarn. I let them sit overnight again, then did a final rinse in cold water. NOTE: The use of a mordant on fabrics before dyeing to achieve stronger colors is explained here. With natural dyes, you can generally choose your own adventure, different processes bring different colors but it is rare that you're doing it "Wrong," it is all just an experiment really. I chose to do a cold dye bath and leave overnight instead of heating up and rinsing after an hour or two, as I often do, to see what the difference is. Below, red onions doing their crazy color transformation. This was not my first experience dyeing with them but it still never ceases to amaze! Makes it worth separating my onion skins. To dye with red cabbage, below, I took some shriveled leaves from the outside of the head. The resulting color was a bit of a surprise, I expected a lavender but the bright indigo was more than welcome. Makes me wish I had saved more of the outside leaves when harvesting from the garden! I've heard it isn't necessarily very washfast (meaning when it is washed, the color isn't likely to stay) but I'd like to do some tests. Black bean soaking water is one of the more foul smelling dye options, especially if you don't use it right away. You could probably use the liquid that comes with canned beans, but these fabrics were dyed with soaking water from dried beans soaked overnight. Carrot greens turned out a subtle but lively yellow. To be honest, I could only scavenge a couple dried fronds from the 'root cellar' (a.k.a. a milk crate in the garage full of the final harvest from the garden) but figured I'd try anyways. Regular carrot tops were used for this, but Queen Annes Lace and most other wild carrots will give a nice yellow as well. Yellow is pretty much the easiest natural dye to extract, the green tops of many floral plants will provide yellow and don't require a lot of processing. Finally, yellow onion skins and their predictable, lovable golden selves. For the most part, the silk fabrics absorbed the colors much darker than the cottons, though interestingly enough most of the dyes in this test seemed to produce the same color with the mordant (which is not the case with many of the other natural dyes I use). The unmordanted fabrics are the smaller squares. My next step is to see what impact light and washing have on the final colors. Some swatches will be placed in the sun, half covered, and some will be sewn together and thrown in with the laundry the next few cycles. I also plan on doing more research with these swatches, testing how changing the pH transforms them, and using iron and copper liquors to change the colors as well (I'll write another post on how to make this iron and copper liquors yourself). Stay tuned for further transformations! Have you tried any of these yourself with different results? Want to know more about mordants on fabrics? Have any questions / recommendations / comments? Please let me know!